Carving Mount Rushmore was no easy task. It took 14 years and nearly 400 men to shape the 60-foot-high faces out of unforgiving Black Hills granite, often from precarious angles and dizzying heights. The men who crafted the memorial worked hard—but they also played hard. Lincoln Borglum, the son of sculptor Gutzon Borglum, was a big fan of baseball. In fact, it’s one of the ways the boss’s son got in good with the working-class guys. On important game days, Lincoln parked his car by the hoist house and left the radio on so the hoist operator could listen to the game. The operator would then phone scores and game updates up to the men working on the mountain. 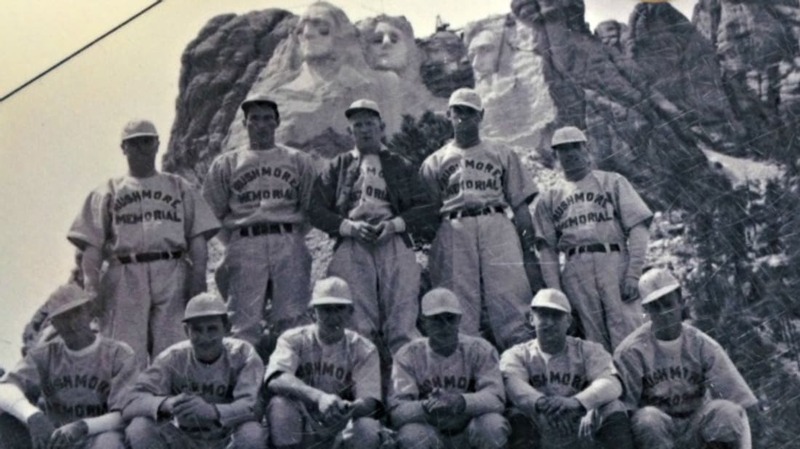 Realizing that everyone's shared love of the sport could be used to bolster camaraderie, the Borglums decided to form a Mount Rushmore baseball team to play against other local amateurs. The whole community rallied behind the Rushmore Drillers, and thanks to the Borglums’ recruiting efforts, the team made it to the semi-finals of the State Amateur Baseball Tournament in 1939. They placed third. After a particularly thrilling game that went into 10 innings, Gutzon Borglum invited both the Drillers and their opponents back to his house for dinner. Unfortunately, the guys didn’t have too many years after that to enjoy their successful team—they disbanded when work on the monument ended following the death of the elder Borglum in 1941.